Parker, J.; 1894. 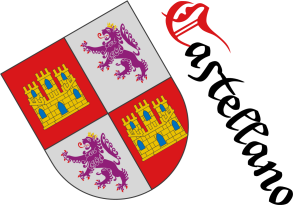 4 different blazons and 8 coat of arms. Emblemata; 2013. Parker, J. H.; 1847. James Parker, «A Glossary of Terms Used in Heraldry, a New Edition with one Thousand Illustrations», XXVIII and 660 pages with pictures, edited by James Parker and Co., Oxford and London (at the 1st page), printed by James Parker and Co., Crown Yard (at page 660), Oxford, October of 1894. John Henry Parker, the father of James Parker, was also the editor and author of a previous book [Parker, J. H.; 1847; A Glossary of Terms Used in British heraldry]. James Parker, in the introduction of his book, writes about the innovations, updates and improvements he contemplates, which make it more a new book than a new edition of his father's. A review and critics of this book can be readed in [Stock, E.; 1895; The Antiquary, Volume XXXI]. In some places it is written the name of Henry Gough as author of this book and, also, his father book, but I do not find within these books the author Henry Gough. The error is due to a later print of this book, see [Parker, J.; Gough, H.; 1966]. a second text «From the bequest of Mary Osgood of Medford, Massachusetts». This scanning of Google has errors mainly in the very first 8 pages, and its images are not well viewed in all digital reproductors, but this scanning was used for some digital editors for make new digital versions of this book, for example, [Parker, J.; 2010]. The last scanned page contains the loan record of this library, with stamps from the year 1976 to 2000. This book contains a frontispiece with the coat of arms of Richard Willoughby, Esq. (Esquire), son and heir, ob. s. p. (obiit sine prole, died without issue~offspring~children, at least, without legitimate ones) 1471. The explanation of the arms and quarters of Richard Willoughby are at the pages 396, 397, 398 and 399, under the term «marshalling» arms. On the page next to the frontispiece, under the full title of this book, there is an oval version of the coat of arms of the University of Oxford from the Schools Tower erected A.D. 1619, its blazon is «Azure, an open Book Argent, leathered Sable and Gules, garnished Or, charged with the motto Dominus Illuminatio Mea; between three open crowns Or, two and one». The father's book [Parker, J. H.; 1847]. The son's book [Parker, J.; 1894]. A review of the book [Stock, E.; 1895]. A paper reprint [Parker, J.; Gough, H.; 1966]. A paper reprint [Parker, J.; 1970]. A paper reprint [Parker, J.; 1971]. The Google scanning process, 2007. An example of a digital edition [Parker, J.; 2010]. Classification: Dictionary and English language. The author is Parker, James. On-line version coded by Saitou. Archive.org (Henry Gough, erroneous co-author). Quarterly: 1 Gules; 2 Chequey Argent and Gules; 3 Chequey Gules and Or; 4 Argent. Quarterly: 1 Or; 2 Chequey Argent and Gules; 3 Chequey Gules and Or; 4 Gules. Quarterly: 1 Gules; 2 Chequey Argent and Gules; 3 Chequey Gules and Or; 4 Gules. Quarterly: 1 Or; 2 Chequey Argent and Gules; 3 Chequey Gules and Or; 4 Argent. 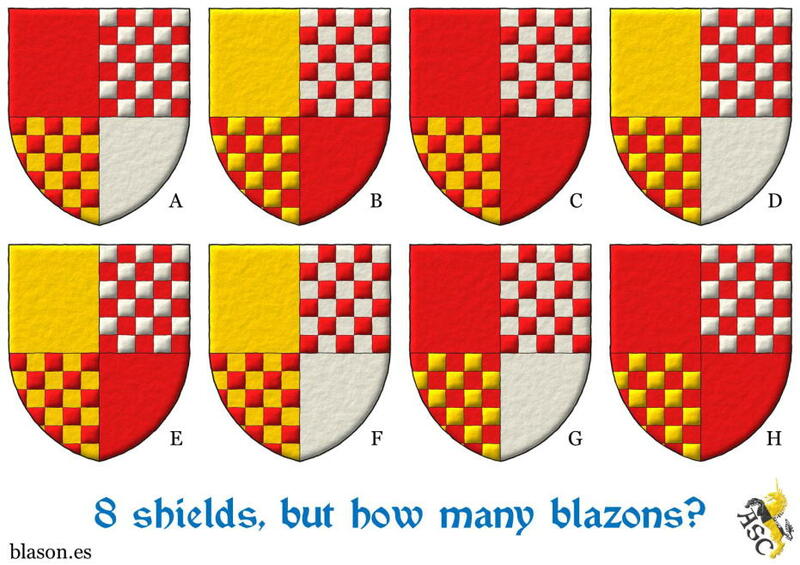 Categories: Riddle solution, Gules, Or, Argent, Quarterly and Chequey. Baron of Valdeolivos Emblematic Chair, of the Fernando el Católico Institution, of the Centre of Scientific Research (C. S. I. C.) y of the Excelentísima Diputación de Zaragoza, «Emblemata», Volume 19th, Emblemata Aragonesa de Emblemática Magazine (E. R. A. E.), 558 pages, ISSN 1137-1056, Legal deposit Z.3.937 1996, Printed by the Cooperativa de Artes Gráficas Librería General, Zaragoza, 2013. Author: Cátedra de Emblemática Barón de Valdeolivos. John Henry Parker, «A Glossary of Terms Used in British heraldry, with a chronological table illustrative of its rise and progress», 360 pages with pictures, printed by J. Shrimpton, Oxford, 1847. John Henry Parker (1806-1884), the author of this book among others, was an English archaeologist, publisher, writer on architecture, member of The Most Honourable Order of the Bath (CB), and father of James Parker (1832 or 1833–1912), editor and author of [Parker, J.; 1894; A Glossary of Terms Used in Heraldry], a renewed edition of this book. Can be read about the relationship between these two books of father and son in [Stock, E.; 1895; The Antiquary, Volume XXXI]. In some places it is written that its author is Henry Gough, but I do not find within this book the author Henry Gough. The error is due to a later print of this book, see [Parker, J.; Gough, H.; 1966]. Preface, signed the 30th of November of 1846, pages I and II. 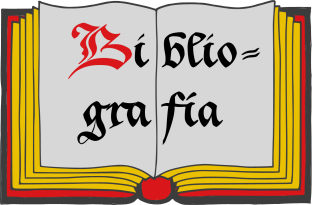 Bibliography, with 21 bibliographic references in the page III, with 24 bibliographic references, including [Nisbet, A.; 1722] and 4 rolls of arms in the page IV, and with 4 bibliographic references in the page V.
The page VI is empty. A chronological table illustrative of the rise and progress of armory, especially in England (see also shield, badge and crown) prom page VII to page XXIII. Glossary of terms used in british heraldry by alphabetical order, begining with «abased or abaissé» and ending with «zule», from page 1 to page 330. Addenda and corrigenda, from page 331 to 339. Alphabetical index, from page 341 to 360. Royal Collection Trust, RCIN 1052229, author John Henry Parker. John Henry Parker, archaeologist, writer and publisher. Google books (Henry Gough, erroneous author). Azure, an Angel Argent, crowned, crined and vested Or holding an open Book Argent. 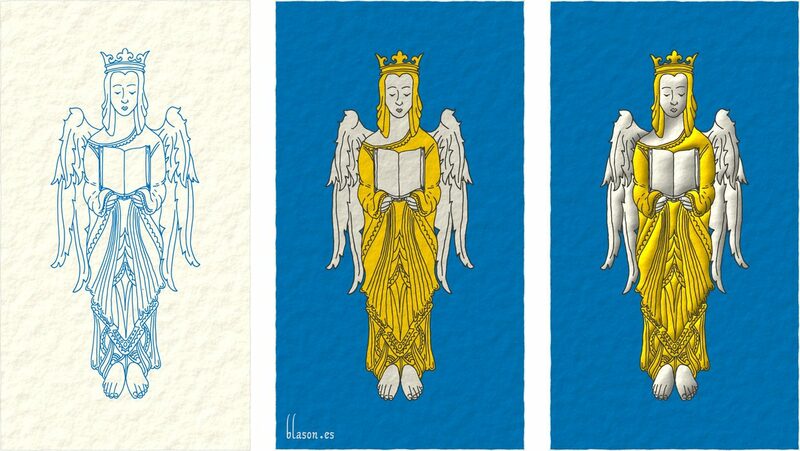 This image shows 3 working steps: a) drawing outlined, b) plain tinctures metal argent and metal or charged on plain colour azure and c) the angel holding an open book already finished. Blazon keywords: Azure, One, Angel, Argent, Crowned, Crown, Crined, Vested, Or, Charged, Book and Open. Style keywords: Freehand, Outlined in sable, Spot ink and Illuminated. Or, three Horse's heads Sable, couped, in pale. 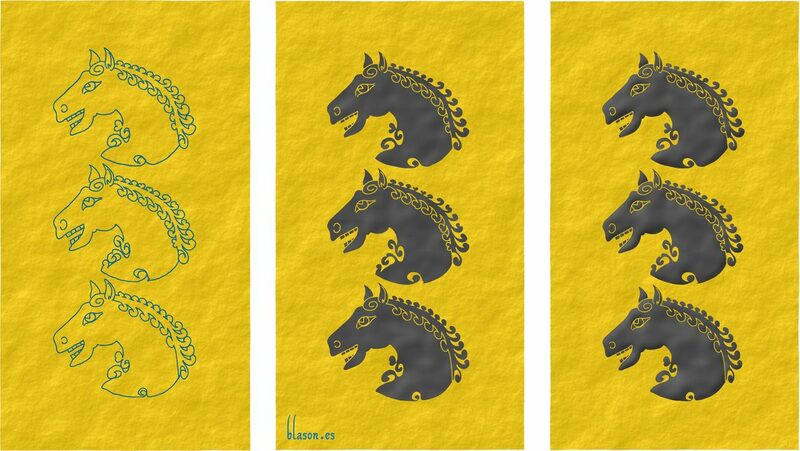 This image shows 3 working steps: a) drawing outlined, b) plain tincture colour sable charged on plain metal or and c) the 3 heads of horse already finished. Blazon keywords: Or, Three, Head, Horse, Sable, Couped and In pale. Style keywords: Freehand, Outlined in the field tincture, Spot ink and Illuminated. Sigue por: Club Ecuestre Val'Quirico. Open, Chequey, Azure, Bibliography, Horse, Crined, Head, Charged, Club Ecuestre Val'Quirico, Crown, Crowned, Couped, Created, Quarterly, Outlined in sable, Outlined in the field tincture, Dictionary, In pale, Schema, Gules, Illuminated, Castilian language, English language, Book, Or, Party per pale, Argent, Rounded, Magazine, Sable, Century XIX, Century XXI, Socioeconomic, Riddle solution, Spot ink, Freehand, Three, One, Vested and Angel.